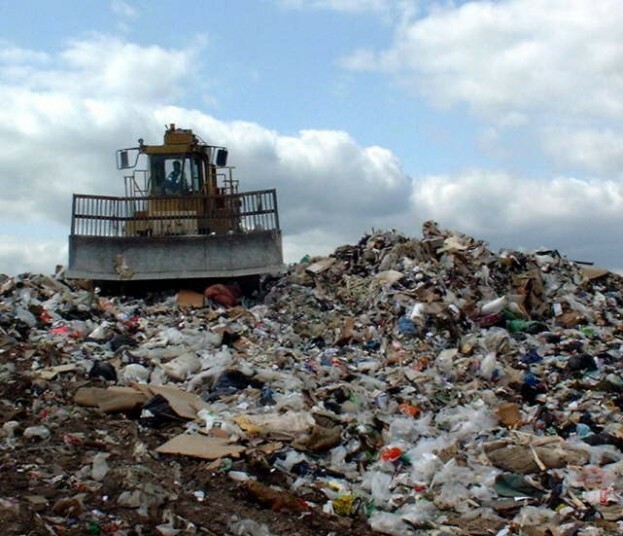 The following page is a historical page full of pictures of landfills which we have kept from our original website. By today’s standards of multi-media web pages these landfill pictures look of really mediocre quality, but we hope you will find this page interesting for its historical images. Please note that that this web page is about 15 years old, and in 2000 the internet was much slower so pictures took some time to appear on pages. All the landfills shown are very small by modern standards, and are no doubt now all closed and restored to farmland, parks, or even golf courses! The following landfill pictures are copyright free, and these or larger versions can be downloaded and used in your project. Click on each image for further information, and you will find that a larger version of each image appears in a new window. Right hand click to save to your own hard drive. Tipping in progress in a quarry landfill, with a new clay lined cell developed and ready for infilling with waste in the immediate background. Tipping into an active landfill cell. 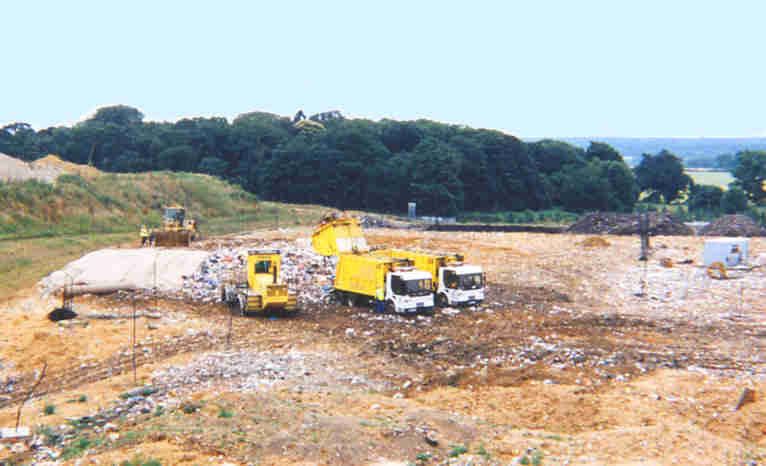 Temporary cover can be seen in the foreground, and beyond the tipping refuse vehicles a “compactor” vehicle stands ready to spread crush and compress the freshly deposited waste. 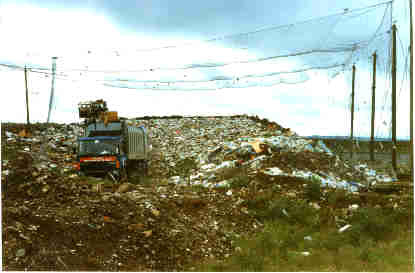 Tipping in progress at a small rural landfill. The tipping area is completely covered by a temporary bird net. Here’s a very active landfill cell. 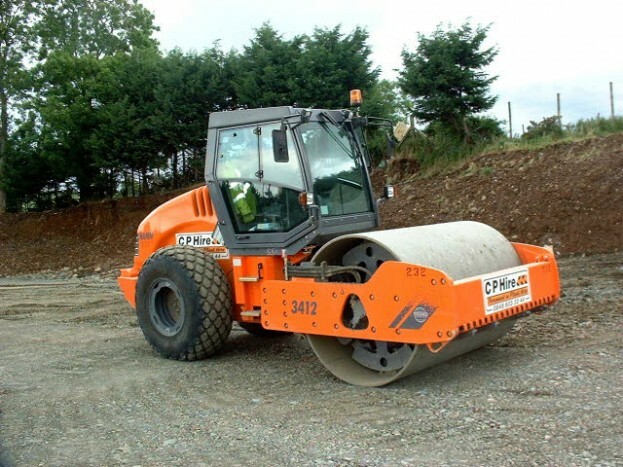 While the heavy compactor machine works on the day’s rubbish running over it with special cutting wheels to squash and compress the waste, other trucks tip dark gery coloured restoration capping material. In the background sand can be seen in the active sand quarrying part of the site. As the sand is removed and sold for construction, new waste void is created for future landfilling. The waste is placed in cells. Each cell is lined to contain the gas and dirty water (leachate) which is produced when it rains on the compacted rubbish.